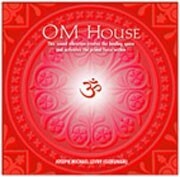 Om House by Gurunam. Ong stimulates the psychic centers and is known to have certain therapeutic values. The sound vibrations on this album, create the healing space and activate the primal force within. The Primal Sound: OM (Ong) / Aum (Aung). There was a time when the word was believed by most traditions to possess tremendous power. The sacred word is seen by some as the authoritative word by which all thoughts become objectified-made reality. The divine word OM, which is nothing more than AUM, is pregnant with mysterious power. OM stimulates the psychic centers and is known to have certain therapeutic values. The sound vibrations on this album, once more ingeniously put to different musical variations, create the healing space and activate the primal force within.